In this section you'll add some classes for managing movies in a database. 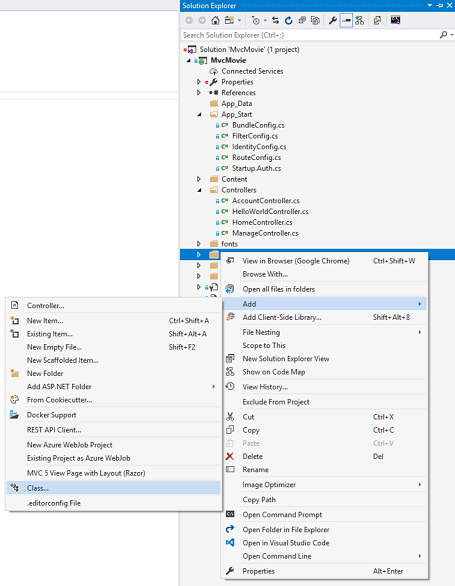 These classes will be the "model" part of the ASP.NET MVC app. You'll use a .NET Framework data-access technology known as the Entity Framework to define and work with these model classes. The Entity Framework (often referred to as EF) supports a development paradigm called Code First. Code First allows you to create model objects by writing simple classes. (These are also known as POCO classes, from "plain-old CLR objects.") You can then have the database created on the fly from your classes, which enables a very clean and rapid development workflow. If you are required to create the database first, you can still follow this tutorial to learn about MVC and EF app development. You can then follow Tom Fizmakens ASP.NET Scaffolding tutorial, which covers the database first approach. Note: In order to use System.Data.Entity, and the related class, you need to install the Entity Framework NuGet Package. Follow the link for further instructions. Note: Several unused using statements have been removed. Visual Studio will show unused dependencies as gray. You can remove unused dependencies by hovering over the gray dependencies, click Show potential fixes and click Remove Unused Usings. We've finally added a model (the M in MVC). In the next section you'll work with the database connection string.